Welcome to Part III of what’s become my annual visit to Manchester for self-styled two-day Northern Coffee Party, Cup North which took place at the start of November. In Part I, I looked at Cup North’s new venue, the Victoria Warehouse, as well as running my eye over some of the exciting kit on display and watching some of the competitions: the Tasters Cup, my favourite barista competition, and the (in)famous coffee-throwing championships! Last week, in Part II, I focused exclusively on the coffee. I started with a demo of The Dragon, a manual syphon method, then I got to play on a pair of espresso machines, a Victoria Arduino Black Eagle and a La Marzocco Strada. Finally, I set myself a challenge to convert some friends to the wonders of not putting milk or sugar in their coffee with some help from Grumpy Mule. This week, in Part III, I’ll have a look at all the wonderful food on offer, whiz round the rest of the roasters (there were an awful lot of roasters at Cup North this year), including an important but often overlooked aspect of the coffee industry: milk. Finally, there’s brief mention of everyone I missed. One of the best parts of last year’s Cup North was the extensive street food offering, organised by Grub. This year lived up to that high standard with an array of tents and food vans parked up outside the venue (these were, in fact, the first thing I saw when I arrived at Cup North). On the first day, I popped outside during a brief pause in the rain to visit the Sheaf Street Pop-up from Laynes Espresso. Laynes, which started life as a coffee shop around the corner from Leeds Station, got the food bug with a monthly brunch takeover at Belgrave Hall, where Laynes also has a coffee stand. This in turn led to the latest venue, the Sheaf Street cafetiere, and this, which is effectively Laynes on tour. It’s an impressive set-up, a full kitchen and a reasonably-sized seating area, all in a single tent, offering a small, but very tempting brunch menu. I selected the Brioche French Toast for lunch, which turn out to be excellent. Nutty and crunchy, it was a long way from my typical image of French Toast (which can sometimes be a bit sickly for my tastes). For lunch on the second day, I discovered that word had got around about Laynes, resulting in them selling out well before my lunchtime. Instead, I made a beeline for Wallace and Sons, which were selling Gyoza (fried Japanese dumplings). I had the veggie option which were also excellent: tofu and a crunchy vegetable filling, plus a sweet & sour sauce. However, the real highlight of Cup North, food-wise, was the cake. On the first day, I paid a couple of visits to Smores, which had a tent outside, next to Laynes. I had a particular reason to visit Smores, having bumped into one of the owners the previous days in Idle Hands, while he was buying espresso shots to go into the coffee & walnut tarts. Naturally I had to have one of these to go with my afternoon coffee and what a great choice: superb pastry, with a strong walnut base and amazing coffee filling. I’d also heard great things about the cinnamon buns, so the following morning I had one for breakfast, which I consumed while chatting with the Commodities Connoisseur. However, day two really belonged to Cakesmiths who had an amazing old-fashioned display case, right at the far end of the furthest room. To reward those who found the stand, the guys spent the weekend handing out free samples of cake to anyone who wanted it. For some inexplicable reason, I ended up trapped at the stand for ages and, since it would have been rude to refuse, I sampled quite a bit of what was on offer. The highlights for me were the smashing pumpkin loaf and the banana and chocolate bread (both toasted of course). The pumpkin seeds really made a difference, giving it both a wow factor and pleasing sweetness. Similarly, the chocolate chips were a revelation, melting delightfully when toasted. Anyway, all this talk of coffee leads me nicely onto the subject of roasters, who you can meet after the gallery. There really were a lot of roasters at Cup North and so this is going to be a very quick round-up of them all. Taking my lead from the gallery, I’m going to do them in alphabetical order, starting with Allpress, who’d come up from London. I know Allpress’ Redchurch blend very well, but I was intrigued by the Two of a Kind blend which was in the other hopper. Allpress roasts an interesting range of coffee, but I don’t often see it in shops, which is a shame. The Two of Kind, a blend of Colombian and Kenyan coffee, was much fruitier than I’m used to from Allpress and, while I liked it on its own, I much preferred it in milk. Next is J Atkinson & Co., who I love to visit, just so I can have a look at the magnificent lever espresso machine, a Faema E61. Imagine my surprise when I arrived at the stand to find the Faema was nowhere to be seen, and, in itself place, a Sanremo Opera. While a very fine machine, it just doesn’t have big enough levers! Instead, I got over my disappointment by picking the brains of the various baristas about where to get good coffee in Lancaster which will hopefully lead to a long overdue visit in 2016. Rounding off the ‘A’s comes Avenue Coffee who I’d caught up with after the Glasgow Coffee Festival and who will be featuring in a Meet the Roaster early next year. I’d popped by to try some of head-roaster Katelyn’s excellent decaf and was well looked after by the Western Avenue crew, who made me a lovely Aeropress that kept me going without sending me over the (caffeinated edge). 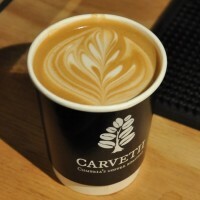 Moving onto the ‘C’s, my very first stop of Cup North was to see Gareth, Angharad and Stephen at Carvetii, where the new seasonal espresso blend was on offer. I had a lovely flat white to get my festival off to a great start. We also continued our chat from the Glasgow Coffee Festival about the difficulties in operating in predominantly rural market. Hopefully 2016 will also see me paying a visit to the Lake District and Carvetii HQ. I also caught up with Casa Espresso, who have been roasting in Bradford for a year or so and who I first into at the London Coffee Festival earlier this year. What’s been impressive is to see the evolution in Casa Espresso’s roasting, from the early batches I tried at the start of the year to the single origins which were on display at Cup North. I was particularly interested in the Ethiopian which I had as an espresso. This was very different from a stereotypical Ethiopian, not nearly as bright or fruity as I’d expected and with a lot more body. Finally, in the ‘C’s, I caught up with old friends Clifton Coffee Roasters, who were there in conjunction with Manchester’s TAKK. As well as admiring the glorious lines of the lovely Kees van der Westen espresso machine, I also tried the new Northern Projekt seasonal espresso blend. A well-balanced espresso, it was nonetheless quite bright and pulled rather long (19g in, 40g out), which I enjoyed. Also had a Kenyan single-origin filter which was really smooth and fruity. Why can’t I get Kenyans to taste like this when I make them at home? Sticking with Manchester, I called by to see James Guard at Heart & Graft, one of my favourite roasters. I had a quick chat with James, but, having sampled his very fine coffee at Grindsmith the previous day, I decided to keep my caffeine levels under control and pass this time. I did, however, take away a bag of his Ethiopian single-origin which has so far been the highlight of the coffees I bagged at Cup North. Sublime. I had a similar experience at Hope & Glory where I briefly popped in to say hello and grab a bag of the new Wonderland espresso blend. After catching up with so many old friends, I ran into some new folks, Ed and Chris, from Liverpool’s Neighbourhood Coffee who started roasting earlier this year, although, with a background from African coffee importers, Schluter, they have a wealth of experience in coffee. We also share a mutual friend in Robert Leigh, who wrote the excellent From Lime Street to Yirgacheffe. I tried three of Neighbourhood’s single-origins through the V60, starting with a lovely, light, well-balance Ethiopian, which was my favourite. I followed this will a very sweet and drinkable Colombian, the sort of coffee you could drink all day and not be disappointed with. The final selection was a Guatemalan, a dark, bold and with plenty of body, the ideal coffee to end with. Back to catching up with old friends, I popped by to see Dan at Small Batch, who’d come up all the way from Brighton and who served me a very interesting single-origin Rwandan espresso which was amazing in milk, very sweet and well-balanced. As my final flat white of Cup North it was the perfect end to a wonderful festival. Since we’re running through things alphabetically, we naturally come to Workshop and the Gitesi Project. A collaboration between Coffee Sourcing, Workshop Coffee and Nordic Approach, this limited-edition filter coffee from Rwanda was being sold to raise money for the Gitesi project. Before we go, I want to have a quick word about milk, an important but often overlooked part of the coffee world. Stephensons Diary is a milk processor with a difference: it can trace its milk back to an individual herd. All the herds which supply Stephensons are free-range and each has its unique characteristics. By providing this sort of traceability, which matches the sort of traceability that the third-wave industry applies to its coffee beans, Stephensons are able to pay a premium to the farmers, vital considering how dairy farmers are struggling in the UK at the moment. Stephensons are currently only operating in the area around Lancaster. However, talking to other coffee shop owners from around the country, it seems that this interest in milk is spreading, with plenty of coffee shops taking milk from single herds (although I’m not aware of any processors such as Stephensons). Maybe it’s something that the industry (and the Coffee Spot) should be making more noise about. So, after all those roasters, you might be surprised to learn that there were plenty of roasters (and others) that I didn’t manage to catch up with. You can find out who in and after the gallery. Let’s start with the Conti Coffee School, where French Barista Champion, Charlotte Malaval, was giving barista lessons and UK Latte Art Champion, Dhan Tamang, was giving latte-art lessons. This, I confess, was something I deliberately gave a miss, partly because it was so busy every time I went by. Having been lucky enough to have attended a free barista course earlier this year and having had latte-art lessons from Dhan at the London Coffee Festival, it would have been both selfish and rude to try to grab another one when they were clearly in so much demand. However, this was very much the exception, as I’d intended to visit everyone else that follows. I just ran out of time! Let’s start with DR Wakefield, green bean importers and employers of my friend Henry of Lyndon’s Coffee. Despite running numerous cuppings and other events, I conspicuously failed to swing by. I did at least manage to say hello to Bradley and friends at Horsham Coffee Roaster and pick up a couple of bags of coffee, but it was no more than that. I also managed to say hello to Manchester’s ManCoCo, although I arrived after the stand had been pretty much packed up. I also failed to visit the ManCoCo railway arch during my day in Manchester on the Friday before Cup North. However, this was better than I managed with either Caravan or Climpson and Sons, who are both from London, and both of whom had gone by the time I dragged myself around at the end. At least they got photographs. I didn’t even manage that with Bean Brothers, which was annoying as I’d been hoping to try some more of the famous Bean Brother coffee-infused stout which I’d enjoyed at Cup North last year. North Star enjoyed (if that’s the right word) the same fate, although I did at least bump into Kreg to say hello, while I also managed to say hello to Dark Woods while simultaneously mislaying the photograph I took of the stand (although it’s possible I imagined it; the photo, that is, not the saying hello). Finally, I conspicuously failed to say hello to York Coffee Emporium, whose beans I’d enjoyed at York’s Coffee Culture, nor Merseyside’s Brew Tea Co, who I’d been hoping to see. With apologies to them and to anyone else I missed, that’s it for another year. Hope to see you all in person or at another festival in 2016. If you’ve enjoyed my write-ups of Cup North, see what these lovely fellow bloggers have to say about it: yummyfoodmakesmehappy, Commodities Connoisseur, Ellie Gibbs, The Manchester Tart, Gin Fuelled Bluestocking, Sip Scoff Scribe. If you’ve written a blog on Cup North and I’ve missed you out, do let me know. Cup North won the 2015 Coffee Spot Award for Best Saturday Supplement. Don’t forget that you can share this post with your friends using the butons below.